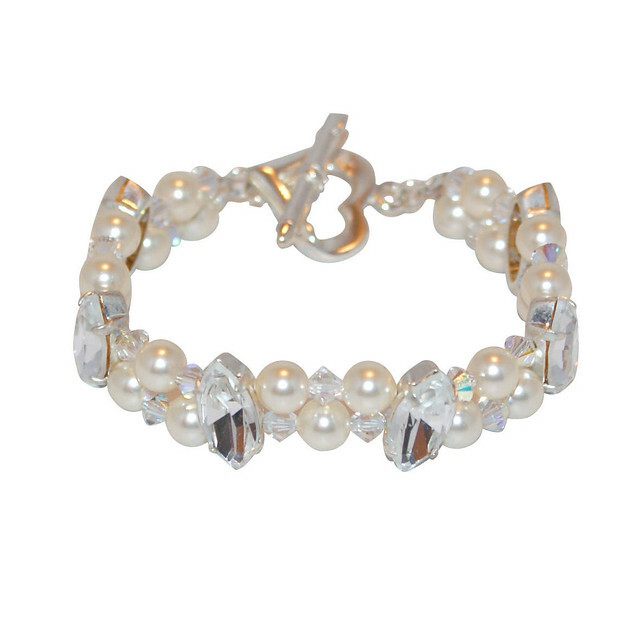 Beautiful bracelet with navette diamantes, Swarovski pearls and crystals. Shown here as standard in Crystal and Ivory, however the Crystals and Pearls can be changed to any colour combination on request. This is a perfect bridal bracelet for any wedding outfit. The length of this bracelet is 6.5inches with a 2 inch extender and is finished with a silver heart shaped lobster clasp and not the heart toggle clasp as pictured. Check out the Isabel bracelet to see the clasp and extender.